After working tirelessly for months planning and perfecting your race, we can understand not thinking about the post-event process. However, if you don’t have a plan already in place, you will be missing out on opportunities to increase attendance for your next event. 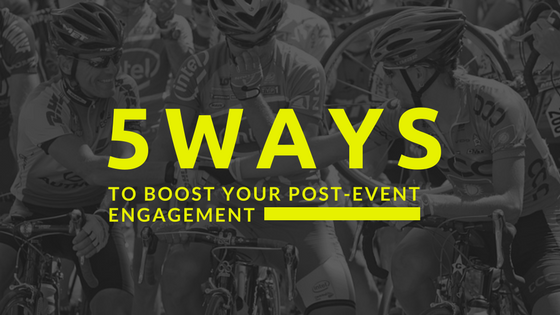 Having a solid post-event plan can increase engagement surrounding your race, which can ultimately lead to more sales. So get on the planning phase sooner rather than later. Here are five tips to help give you a few ideas. Show your appreciation to those that have attended your event in the 24 following it’s close. Email is one of the best ways to do this as the majority of your participants will have no doubt have had some form of email communication with you. Send a personalised message to your recipients where you address them as their first name in the subject. This thank you email also gives you a great excuse for the first communication of the post-event process. You can add other elements in this article to the thank you email, or give the recipient a timeline of what to expect in terms of your communication. This is helpful if you want to extend an offer or something of value to your attendees in the near future as they will be on the lookout for your next email. Whilst their experience is fresh in their mind, the post-event follow up communication is the perfect place to do some market research. The best way to do this is in the form of a survey. The results will provide you with valuable data for your event that can be used in the future. Whilst you don’t want to bombard your customers with too many questions, you’ll need to figure out what the most valuable metrics of your race need evaluating. – What did you like/not like about the event? – Would you attend again? – What would you recommend we do to improve the event? – Would you recommend this event to others? You want your post-event survey to be as quick & easy as possible to fill in, so where possible, keep questions closed. Use a drop down menu or 1 to 10 rankings where you can. Open ended questions are great, but you don’t want to ask people to write out essays for you. Want more people to fill in your survey? Try incentivizing it with some form of offer. The more data you collect, the more opportunities you have to improve your event based on organic suggestions. Do you have some great reviews? Save them for testimonials in your next marketing campaign. As an appreciative gesture, you might want to include an offer for those that attended your race in your post-event communications. The simplest being an early bird discount for attendees who want to jump at the opportunity for the next event. This can be the perfect time to get some more tickets sales as people have the memory of your event at the forefront of their mind. If you have any brands that you have partnered with, this would also be a great time to cross-promote their products and do a bit of affiliate marketing. This is especially true if they had a presence at your event and their offer gives them value. Discounts are not all that can be used either. You can also use this opportunity to highlight aspects such as race photography, finishing times and results and where the participants can find them. Basically, anything to keep the momentum going after the close of your event! After your event, your focus should now be shifting towards digital communications and social media. People will most likely be posting about their race experience on their social networks and now is the perfect time to capitalise. As we mentioned in the previous point, things like race photos and results are great ways to pull people back into your brand’s fold. Get people to tag themselves in the photos you put up and encourage online engagement. You’ll be driving more than usual amounts of web traffic to your pages in the post event phase so it’s important that you take advantage of it. Could you run a social competition whilst interest and views are still high? After all, you don’t want the fun to stop after the event. Give attendees (or those that missed out) some small stuff to look forward to. A common format used is a caption contest using a picture taken during the event using your event’s hashtag. The winner can be the one that gets the most votes or likes. The entries essentially become user generated content that furthers market your brand through post-event engagement. Now the fun part is over, it’s time to start looking towards the future and start evaluating your data. Take in all the data that you have gathered from your post-event surveys, social media engagement & general feedback. This data will be useful in correcting any mishaps to better prepare for future events. Remember, if an attendee has taken the time to fill out a survey or feedback form, they want their voice to be heard. If you receive negative feedback, follow up with a personal message. You should take comments seriously and do your best to implement changes for the next race. Even in the case of negative comments, a follow-up survey gives you the opportunity to make things right and create a positive experience of your brand. Look at what discounts and offers you have distributed and analyse the success rates. Is there room for improvement? Does one form of promotion heavily outweigh another? How about your email campaign open and click through rates? Can you improve those somehow? There will be a whole plethora of options to go through. You don’t need to completely revamp your marketing strategy here. What you’re looking for are small tweaks that can be made that lead to consistent growth and success. Think of your brand as a cruise ship. You can’t drastically change its course, but just a small turn of the wheel can have you moving in the right direction. Want a couple tips on how to improve your next event in the digital landscape? Just check out our articles on the EtchRock Resources for a host of articles at your disposal.